Six years ago when I set out on my Pan-American Expedition I had never heard of Overlanding. I had no idea hundreds, maybe even thousands of people are driving and riding around the world right now, living their dreams. Spending time with seasoned Overlanders Vince and Maryline in Panama and Ecuador changed my life. I wanted to be like them. I wanted it bad. 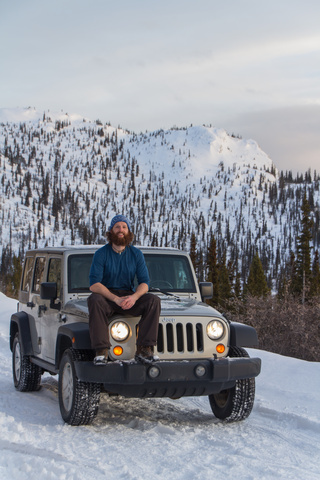 In 2011 I sold my beloved Jeep Wrangler, flew to North America and signed up for a desk job. Within months my trip felt like a dream. I had to look at my own pictures and read my own blog to convince myself it was real. Often I wake in my apartment disoriented and mumbling Spanish, trying to remember where I’d setup my tent for the night. To this day I’m not 100% sure I actually drove to Argentina. While I struggled to re-assimilate, Vince and Maryline concluded their round-the-world journey, shipping to Africa and driving North on the West Coast. Vince wrote in French, so I was following along using Google Translate. The poorly translated sentences added to the impact they had on me. I will never forget one update from Vince, one that I’ve been thinking and dreaming about ever since. There is something about the earth here. I can feel it in my bones…….this is where I come from. …Africa is where I come from. Two years on the road from Alaska to Argentina taught me more than I ever could have imagined. It taught me a lot about exploring and living out of a vehicle, what I’d want in a future rig, and where I want to explore next. It taught me the exhilaration of exploration in a foreign country, learning a new language and meeting all kinds of different people. More than anything else, my adventure taught me I want to keep exploring new countries and continents, and I want to do it with my own vehicle. 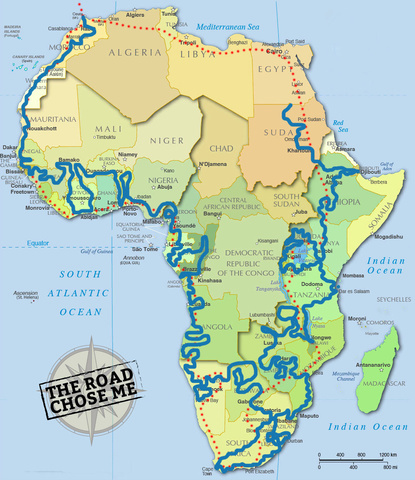 Two years circumnavigating the African continent. 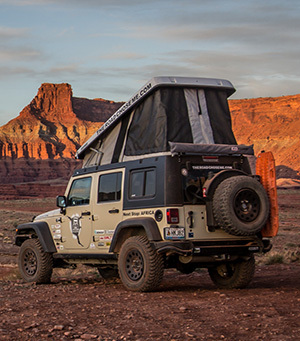 I’m bursting with excitement to announce I’ve partnered with with JPFreek Adventure Magazine as the exclusive media outlet for the details of my 2007 Jeep Wrangler JK build and preparation, then as the home of the Jeep-related videos, photos and stories from my travels. 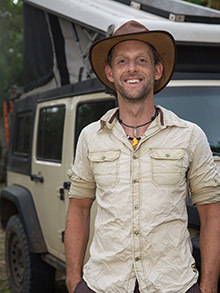 As I write about my days in Africa here on The Road Chose Me, I will work with JPFreek to show more details about how the Jeep really is another member of the team along with any interesting stories, issues and fixes. See the trip announcement in the latest issue of JPFreek Adventure Magazine. My new ride – of course it’s a Jeep! Thanks Bryon, I’m stoked beyond belief! This is awesome news, I can’t wait to follow along! Have fun! Fantastic plan. Will enjoy following vicariously from Mildura. Can’t see on the map though how close you are to Tripoli. An ex Mildura friend has been working in Libya and would suggest you get very accurate advice before entering if you want to keep the jeep. Just needed to pass that on. Fantastic! Looking forward reading about your adventures in Africa! Congrats on starting out on a new adventure! I’m not much of a car geek, but I must say the new build looks exciting. I’m guessing your going to be getting the J30 pop top? It looks pretty slick! 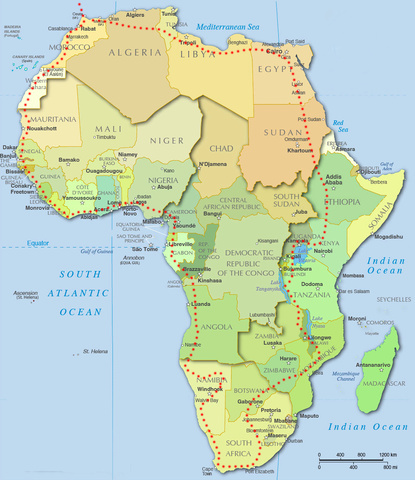 Whats the plan for internet access around Africa? Thanks man I’m super excited! Yep, I’m getting the J30, and I’m working with the manufacturer (Ursa Minor) on a few modifications which I think will be sweet. I’m told I’ll find great internet access in the big cities – and unfortunately I will have to go to most of the big cities to go to consulates to get visas for upcoming countries. So in those cities I’ll spend a day uploading photos and videos. When I’m out in the sticks, I have no idea what I’ll encounter. I think it will be spotty and slow, so uploading stuff will not be possible. I looked into portable satellite options, though the costs are insanely prohibitive. I’m taking the “land” equivalent of a PLB, a SPOT locator beacon. Basically you can send messages to friends, and it has a “help” button to call the cavalry. It’s cheap peace of mind. Why did you choose the Ursa Minor top over the Habitat? I have a friend trying to choose and since we are on the East coast, he can not see either but still we discuss which is better…. Just curious and good luck on your trip! Great question, and something I’ve though a lot of time thinking about. In the end, as I’m only one person I don’t need the extra space provided by the habitat. If I were 2+ people, the habitat would be my pick for sure. You friend should try and go to Overland Expo East , there is sure to be a habitat and a J30 there this year. I got to see both at Overland Expo West last year, it was nice to crawl all over them with a tape measure and really understand them. I very much enjoyed reading your trip through the Americas! I am excited to see that you will be starting another adventure! Would you mind discussing why you are going with such a heavily modified jeep this time around? I myself have run into trouble sourcing pieces for aftermarket parts on my jeep in some of my travels around the US, I ended up making a temporary bushing out of tubing and duct tape to get by until I could meet the shipped parts. With a more stock vehicle, it would be more likely you could get parts from one of the dealerships in Africa, with aftermarkets, you’re limited to shipping from wherever they are based, or fabbing on site. Definitely not trying to be critical, just a thought that came to my mind when I was reading the JPfreek article you linked to. I’m happy to hear you’re on board for the next one! Spending two years living in my last Jeep taught me a lot about what I do and don’t want. 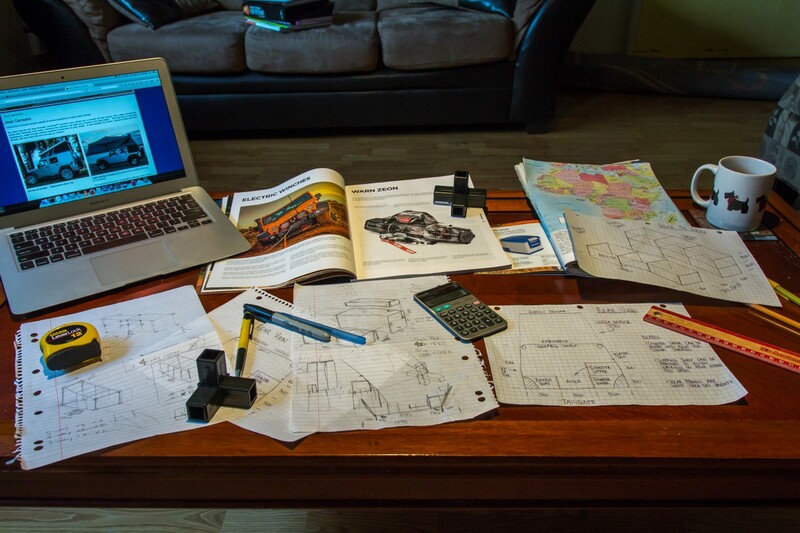 You’d be amazed how often your mind wanders to thinking of vehicle improvements. I’ve known for a very long time I wanted to improve a few major things – sleeping, cooking and food storage and mileage to name a few. While I am making lots of modifications, I’m trying as hard as I can to keep things simple and sturdy without adding extra weight. I’ve been thinking about these modifications for years, and I hope they’ll combine to make the Jeep more reliable and robust, not less. The vast majority of modifications won’t have ‘parts’ so to speak like the bumpers, snorkel, etc. The diesel engine is the big contradiction to all of that – though I think it will work out because the engine is entirely mechanical with no computer control at all, and the diesel should get much better mileage, meaning I will have more range (and spend less money) without having to carry extra heavy gas. Dan, your trip,sounds rad, and strangely familiar. My wife and I are also converting out 2007 JeepWrangler Unlimited to diesel (Cummins 4BT) and shipping it to Africa in November! We are shipping to South Africa, and heading, in a round about fashion, to Morocco. Follow along on our website. 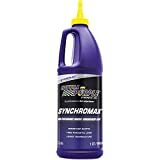 I’d love to hear what changes you’d make to improve living/sleeping/eating/mileage when living out of a Jeep. I’ve just decided to make the trip from Alaska to Argentina as my next big trip, probably starting in about 18 months. My last big trip was around much of the US in an RV, but this time I’m thinking I may do the trip in my own Jeep (a Liberty) rather than monkeying around with trying to buy another RV. Absolutely I will be writing a lot more about the modifications I’ve chosen to make to improve living/sleeping/eating/mileage. Stay tuned for the next edition of JPFreek Adventure Magazine! Why would you do a diesel conversion? That introduces possible engine gremlins for your trip. Why not just go with a Euro-spec factory diesel Wrangler? I’m going for the conversion for quite a few reasons. Range, Mileage and reliability. The engine I’ve chosen is all mechanical, so it’s extremely simple and durable. You’re right there is a risk of introducing gremlins by messing with the factory drive train, hopefully that doesn’t happen. As for buying a Wrangler in another country – it’s much harder to buy and register a car in a country you don’t live in than you might guess. I also need to get a Carnet for this one (sort of like a passport) and that’s also very hard to do in a country you don’t live in. I certainly thought long and hard about it. I also don’t want Right Hand Drive. Also, I want to do a lot of work to the Jeep before I set out, and North America has the best 4×4 aftermarket by a very wide margin. 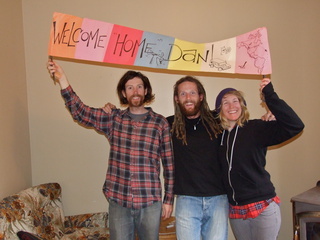 Dan, can´t wait to see how the trip unfolds. You will be traveling through some spectacular places. If you ever need a hand in South Africa I´ll see what I could do to help. Give me a shout. I live an hour south of Durban. Later….. Cool. Don´t know what filter system your diesel is using but make sure you bring a few spare. The diesel through Africa is a shocker and the last thing you need here is injector issues. Guys often fit an extra inline filter after the oem one just incase. Just to give you an indication, I have to change my work van filter every 10000km here in SA, so it´ll be worse up north. Absolutely I’ve heard that advice many times, so I trust you. We’re fitting the finest filter/water separator we can buy, along with the OEM filter. I think I can get 1 micron which should be plenty. Also my diesel is not CRD and isn’t computer controlled – it will literally burn kerosine, so hopefully it will be OK with the odd batch of not-perfect diesel – it’s one of the main reasons I picked the engine I did. I grew up in Australia, so Hiluxes, Land Cruisers and Land Rovers are a dime a dozen. I don’t find them particularly interesting, and it’s difficult to buy and register a vehicle in a country you don’t live in, especially when I need to get a Carnet for it, which is a bit like a passport for a vehicle. I would highly suggest an alternative design for your roll bar modification. That rear tube needs to be notched properly and be welded between the side supports to safely deflect any load from any direction. I would also suggest a diagonal support bar in the sides and across the top. That design is likely actually weaker than the factory “roll” bar. Hi Rich, thanks for the input. There will virtually never be anyone sitting in the back (no back seat), so I really only care about the safety for the two front seats, and I didn’t modify anything there so I think I’m OK. When will you start? I can’t find that info here, but maybe I’m missing something? I’ve already started! I’m in the middle of an 8,000 mile road trip across North America, building the Jeep and preparing everything I need. The currently plan is to ship the Jeep to Europe in early November, and drive down into Morocco for December 1st. 2011 Jeep? What happened to the 07 with Diesel conversion? Is the Diesel still a future project to complete or have you given up on the idea? Sorry if you answered this in your blogs already but I went looking and I could not find it. Now I can move forward! Dan I hear you will be hunting with a home made slingshot from Idaho. Can you keep us posted on how your progress is doing. Absolutely, lots of updates incoming, check here and I’m posting to Facebook, Twitter and Instagram too. I am so jealous that its inspiring! I follow you on intagram (@blaize360) and love seeing your travels. I would love to meet you some day, so if you are ever in the PNW again I would love to buy you a beer and be ever grateful to hear your stories and learn hoe to set up my jeep for traveling some of the same roads you have explored! Hope you have an amazing time in Africa! (if you can get this message) if not welcome back! I am certain I will get back to the PNW one day. Not soon, but one day! Yes, Toto is on the only CD I have in the Jeep, I blast it at least once a week.